Editor's note: Poker Books are as important as ever. Even though there's a lot of content out there, poker books are still something to improve your game by. Before you buy a poker book, though, be sure to check out the Poker Rules. Equally important, go through the Poker Strategy section for an extensive library of free poker content. My task is to select the most important strategy books ever written from the many hundreds of texts which have been published. First, these books aren’t necessarily my personal favorites. In fact, any “favorite book” is a deeply personal judgment. Whichever poker book(s) helped us improve our understanding of the game should rightfully be among our “favorite(s).” Every player has different needs and remedies, since we’re all at different levels of experience and developmental stages. For example, an advanced poker book containing sophisticated concepts might be a great primer for experienced players. But for the vast majority of recreational and novice players, something far more simple is probably needed. Advanced strategies might even be dangerous for players who don’t grasp the basic fundamentals of the game. According to my estimate, about 450 poker strategy books are now available through Amazon, and other sources. Many of these books are obscure titles and texts you’ve probably never heard of, and will eventually become forgotten as time passes. That said — any poker book that improves our understanding of the game and inspires us to think more deeply about poker strategy is likely to be well worth the price. Hence, most poker strategy books — even those containing some questionable advice — are at least worth reading and thinking about, even if not following the advice to the letter. What I have highlighted here are the books that had a profound impact on the game and altered the thinking of a significant number of players. I refer to books that fundamentally changed the way poker is now played. Some books were so influential when they were written, that to have not read them put those who were ignorant at a serious competitive disadvantage (much of the Two Plus Two (2+2) catalog applies here). The top-ranked books codified poker strategy as never before to the point where there’s now little or no argument about the correct decision and ultimately the right play. These master works not only helped us become better players, but they also explain why the conclusions drawn are correct. I expect you’ll agree with some of these choices, which are obvious and irrefutable. Other books making the list are lesser known, but still influenced the game’s great thinkers and best players. A few others are more obscure titles, but still managed to gain peer respect, and even went on to fundamentally advance the science of poker thinking. Let’s begin with selections that made the “Honorable Mention” category. Then, I’ll elaborate in greater detail why each of the top 10 books was chosen in a progressive countdown all the way up to number one. The Full Tilt Poker Strategy Guide by Michael Craig (2007) — “Full Tilt” might be a toxic name now and a sour memory for many poker players. But there was a time when the Full Tilt Poker stable of pros were the rock stars of the game. This powerful and ambitious 437-page strategy guide, organized and overseen by Michael Craig, one of the game’s best writers, with contributions from many of poker’s most accomplished pros, is top notch throughout. If you can get past some of the names and ignore the harm they did to the game, just about all the advice is solid. Kill Phil by Blair Rodman and Lee Nelson (2005) — This book actually changed the way poker was played for a while, especially no-limit hold'em tournaments. Oversimplifying its basic advice, the authors recommend taking an ultra-aggressive approach to the game, which effectively neutralizes the game’s best players. In other words, whenever possible, put the best players to a decision for all their chips. Back then, three of poker’s best players shared the first name “Phil,” which is where this book gets its catchy title. Any Title by Lou Krieger — Mid-stakes poker pro and prolific writer Lou Krieger passed away a few years ago, but he left us all with a wealth of interesting study material, mostly on how to play and beat low- to mid-stakes cash games. Krieger wrote eight books, plus several hundred columns for CardPlayer magazine. Just about any of his works are worth reading. No single book stands out from what is a solid library on poker strategy. So instead, I’ll give Krieger a general shout out and recommend him as an author. Elements of Poker by Tommy Angelo (2007) — This is one of the most “think outside the box” poker books ever written. It probably should be in the top 10, but for some reason, it hasn’t garnered as big an audience as it merits. Angelo, a well-respected pro player and coach examines poker from many different perspectives, including a total of 144 angles. His key concept is something called “reciprocality,” which means success comes from doing something different from what’s normal (or expected). In addition to containing lots of ideas you’ve probably never thought about before, Elements of Poker is also a fun read. It deserves a lot more love. Little Green Book by Phil Gordon (2009) — Phil Gordon was one of the biggest poker stars of the 2000s. This book was released at the height of his fame, coming off his role as host of the television show Celebrity Poker. This was a poker book patterned after a similarly-designed golf book with a comparative title called The Little Green Golf Book by Harvey Penick (which was perhaps copied from Mao’s Little Red Book — but I digress). The Little Green Book sold remarkably well, and was even described by some critics as a shorter version of Dan Harrington’s strategy books. High praise, indeed. The Psychology of Poker by Dr. Alan N. Schoonmaker (2000) — Dr. Schoonmaker is a retired psychologist who plays low-stakes games in Las Vegas. Here’s what’s most unusual about him: he’s one of the best listeners I’ve ever met. I think that says a lot about this author and what he values. Even today when I run into Dr. Schoonmaker around Las Vegas, he’s constantly talking to other people, but, more important, listening to others when they discuss poker. That lifetime of wisdom — from his days as a psychologist to his nights at the poker table — was filtered and eventually put into words in the form of The Psychology of Poker, and his highly-recommended follow up book, Your Worst Poker Enemy: Mastering the Mental Game released in 2007. The Mathematics of Poker by Bill Chen and Jerrod Ankenman (2006), and Weighing the Odds in Hold’em Poker by King Yao (2006) — These are two highly-advanced poker books with excruciatingly detailed math problems and solutions. Recreational players and those with no math background will have a difficult time understanding the text, or following what the authors try to prove. However, both books are noteworthy for their intensive attention to detail and demonstration that winning poker is both an art and a science. The Mental Game of Poker: Proven Strategies for Improving Tilt Control, Confidence, Motivation, Coping with Variance, and More by Jared Tendler and Barry Carter (2011) — I debated whether or not to include such a recently published book on this list. Most books need time to measure properly and years to assess fully. However, this book appears destined for great acclaim given its superior reviews just about everywhere. As the title suggests, there’s a lot in the book to think about when it comes to the mental side of the game. I confess, this is the only book on the list I haven’t read. So, while I’m reluctant to include it for that reason, way too many people I respect give it a high grade, which means it bears mentioning. The Making of a Poker Player by Matt Matros — This is a highly unusual poker book, but one that stands up well over time. Fresh out of college, author Matt Matros started playing in recreational poker games in the Washington, DC area (where I first met him — that story’s in the book). A year later, he was sitting at the final table of a million-dollar tournament called the Tournament of Champions. This book is actually a sort of premonition. Matros wrote about the game and discussed many of the peripheral influences on him as an eager young upstart long before he enjoyed any personal or professional success (some would say “validation”) as a player. After this book was released, Matros then won three World Series of Poker gold bracelets (three straight years), two in the game he mostly writes about, which is limit hold’em. Amazingly, he only plays poker part time. Most authors win big tournaments and become famous, and then they write poker books. The ultra-confident Matros did the opposite. That’s gutsy. Zen and the Art of Poker by Larry W. Phillips (1999) — Zen has become the new age way of thinking for a lot of people who swear by the approach to life. Its basic principles certainly apply to poker, especially if you subscribe to the “toughest opponent at the poker table is yourself” philosophy.Zen and the Art of Poker is a highly welcome psychological self-help tool for players who have problems controlling their emotions or going on what’s called “tilt.” Moreover, it’s not just a simple retread of old sayings by a lot of dead people. The author actually goes into considerable detail about how to apply Zen philosophy to what you do and how you act at the poker table. Well received and a niche guide for self-improvement. Any Title by the Two Plus Two Catalog of Writers — I realize this sounds like I’m shilling for 2+2 and the publishing house started by authors Mason Malmuth and David Sklansky. However, any title of the few dozen from this excellent collection of poker books deserves a look, and probably a read. I include this generic recommendation because just about any of the 2+2 publications are at least worthy of honorable mention. This entry from the mainstream publishing house Kensington might surprise a few people, but it’s a stupendously good poker book geared mostly for no-limit hold’em tournament play. Authored by Gus Hansen at the height of his success as a three-time World Poker Tour champion, one of poker’s most unorthodox players takes you through his thought processes during every stage of a tournament, from the first hand to (what’s hopefully) the final table. Chip Reese, who wrote the book’s foreword, had this to say: “He’s brought original thought to an age-old game. Many of his ideas on how to play poker have made me take a second look at some conventional strategies I thought to be true.” This page-turning book is straight and to the point. Critically acclaimed and groundbreaking, yet still largely underappreciated, Every Hand Revealed merits a spot on this list. Mike Caro was and remains a pioneer in poker strategy. He’s written innumerable articles and reports on the science of poker over the years, and continues to do so today. He’s also a highly engaging speaker who is just as famous for his poker seminars, which have been going for nearly 30 years. In 1984, Caro first released The Body Language of Poker, which analyzed just what it says, body language — including posturing, facial movements, voice inflections, and so forth. His original book was updated 10 years later with new photos and deeper analysis. While not as relevant today and probably applicable only to low-stakes games (if at all), this was a groundbreaking work for its time which was referenced often and was the subject of conversation during many games. With 277 pages of photos and explanations, this book packed in a lot of information and revealed that the real money isn’t necessarily to be made looking at the cards, but rather watching and studying your opponents. Of the many books contained in the Two Plus Two catalog, this is certainly one of the best. It receives no style points. In fact, the concept is almost too simple. Poker Essays is just that — a collection of writings (some might even say, musings) by one of the game’s great minds, Mason Malmuth. What makes this special is that the book isn’t just about strategy; it also discusses the future of the game, suggests improvements card room management could make, and gives lots of other advice geared towards the overall advancement of poker. Here’s a challenge. Go back and read it now, 20 years after its release; you’ll discover many of the concerns and predictions about the game first raised by Malmuth have come true. I used to think he was crazy for writing some of these things. But he turned out to be mostly right. Malmuth is one of only two authors to receive two nominations in the top 10. If any book was a “must read” for all poker players during the 1990s, it was most certainly Hold’em Poker for Advanced Players, first published in 1988, and later re-printed several times since. This is a limit hold’em primer. Since virtually all hold’em played up until 2003 was limit, this book had a major impact on the game and the players who were successful. Some of the concepts, such as the “semi-bluff” (first coined by Malmuth) became part of the game’s unique lexicon. Malmuth broke down a variety of different situations and ended up fundamentally altering the course of games, especially in the period from 1988 (two years after flop games were legalized in California) and 2003, when limit started experiencing a decline in popularity. Most readers have probably not heard of this book. Even serious players would have a hard time identifying it. However, it should be remembered fondly. When agreeing to this assignment, one of the first calls I made was to Dan Harrington. I asked him which strategy books had meant the most to him. Without hesitation, he listed Winning Poker Systems as a monumentally important contribution to poker theory. Released in 1973 when there were virtually no poker books on the market, this was a groundbreaking first step in what would later become a foot race to lay out the best strategy for winning. While terribly dated now because it mostly addresses obsolete poker games like five-card draw and lowball (which were the only legal games played in California at the time), it was the first book to chart starting hands and stress the importance of position. David Sklansky has also repeatedly sung the praises of this book and its author, Norman Zadah, then a young doctoral student who was studying for his degree in Applied Mathematics at Cal-Berkeley. For many players, this was “the book” for nearly a decade. For some, it remains so even today. Arguably, it familiarized more players with the basics of limit hold’em than any other book in history. Perhaps the book’s best attribute is its simplicity, which is somewhat misleading because it also packs in so much excellent strategic advice. It doesn’t look or read like a poker textbook thanks to Jones’ easy-to-understand approach and conversational style. After this was published, Jones later went on to become the Site Manager for PokerStars.com, which became the largest poker site in the world. No doubt, one of the reasons he got that coveted job was because of his tremendous understanding of the mind of the average poker player. That knowledge comes across in the pages of what’s unquestionably one of the most important strategic books ever written. This was the very first book ever written exclusively on the game of hold’em to become widely available. Keep in mind that this poker variant wasn’t widely known anywhere except in some parts of the South, and in Las Vegas. At best, perhaps several thousand people actually knew how to play the game. After this book was published, that number would expand into the hundreds of thousands, and eventually millions. Sklansky must have seen the game’s appeal long before anyone else did. Either that, or he understood that since the WSOP was around to stay, hold’em would eventually become the game of the future. Whatever his reasons, this was an important first step towards understanding how to play and win at limit hold’em. The original edition is somewhat dated now, since most games during that time included only a single blind, so Sklansky updated his book in 1997 to account for the double-blind structure. It’s the shortest book on this list, but certainly a historical groundbreaker. This is the best-selling poker book in history, having now surpassed 300,000 copies sold. Not only did the 1995 world poker champion perfectly time his book’s release, which came at the height of the poker boom, his authorship and fierce independence (as one of the few highly-respected icons not to affiliate full-time with anyone) gives the text an added measure of credibility. Harrington co-authored this book with Bill Robertie, a master chess player and game theorist. The first volume was followed up by Harrington on Hold’em: Volume II. Later, they released Harrington on Hold’em: Volume III, then Harrington on Cash Games, which received similar acclaim. 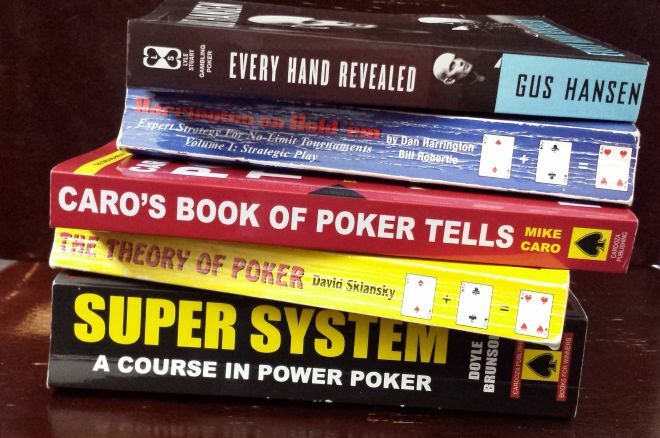 No doubt, all of these books made poker much tougher to beat. But the first release likely will stand as one of the best strategy books ever written. Legend has it that many poker greats were upset when two-time world champion Doyle “Texas Dolly” Brunson decided to capitalize on his emerging celebrity status and give away the keys to the treasury in what became known as Super/System — alternatively titled, How I Won One Million Dollars Playing Poker. The original cover price was a staggering $100 when released during the late 1970s, equivalent to more than $400 today. Still, the book sold steadily over three decades, propelled by a highly-anticipated re-release by Cardoza Publishing in a far less-expensive paperback format. At a whopping 600 pages and bound by a heavy black cover, Super/System — whether intentionally or not — actually resembles The Holy Bible. Indeed, this book packs in a lot of poker knowledge that can be taken to the bank. Aside from strategy, the narrative chapters in which Brunson recalls his poker exploits from the old days come as a highly-entertaining bonus. This was the first book to include contributions from top players who were acknowledged to be the world’s very best at their specific games. Co-authors include the late David "Chip" Reese, Mike Caro, David Sklansky, Joey Hawthorne, Bobby Baldwin, and of course the man himself, Doyle Brunson. This remains an amazing poker book that was decades ahead of its time — arguably the best ever both in terms of quantity and quality. This book is not to be confused with Super/System 2, released in 2004 (which was not as successful). Most game theorists and serious poker players regard this masterwork by David Sklansky as the game’s strategic dictionary. At 276 pages long divided into 25 chapters, this book from Two Plus Two Publishing contains all the basic strategic fundamentals. While not necessarily entertaining nor appealing to casual readers or anyone else other than serious players, this book contains nearly a lifetime of well-researched and painstakingly debated poker concepts, ultimately encapsulated in the sub-title, How to Think Like a Professional Poker Player. Here’s a summation of what’s contained in The Theory of Poker: “Beginning poker players sometimes ask, ‘What do you do in this particular situation?’ There really is no correct answer to that question because it’s the wrong question... The right question is: ‘What do you consider in this particular situation before determining what you do?’ The Theory of Poker addresses itself to such considerations.” I don’t know of anyone who takes poker seriously who hasn’t read this book or who isn’t at the very least familiar with its significance in the chronology of poker knowledge. It’s the benchmark for all future strategy debate and theory discussion. Period. End of discussion. About the Author: Nolan Dalla has been involved in poker as a full-time and part-time player, writer/reporter, author, consultant, and casino executive for more than 20 years. He's best known as the longtime Media Director of the World Series of Poker. Dalla is also actively involved in a new television show coming soon called “Poker Night in America.” He writes a popular daily blog on a variety of current events. It can be read at his website: www.NolanDalla.com.